Xpint is preparing for his trip “home.” Poor thing, I don’t think he enjoys it much. I wouldn’t enjoy sitting in a cage barely big enough for me either, but the vet says he has to get used to his travel accomodations. Since Xpint can’t go home in July due to heat restrictions, we are looking into sending him home in May, and since May is rapidly approaching, I am having to prepare. 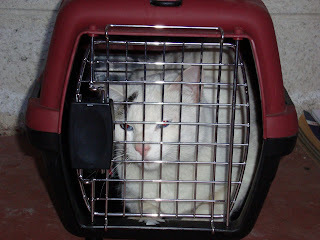 This weekend Andrea and I took our cats into Xela for vaccinations and to buy Xpint’s new cage. Just for a moment imagine the oddity for Guatemalans of two gringas on a bus, each carrying a cat. For lack of a better comparison: imagine two one armed people carrying squirrels on public transportation in the States… you get the idea. I heard whispers the whole way there…. GRINGA! GATO! Not that it prevented people from approaching us. Odd doesn’t begin to describe the trip. Guy: Oh! I need a passport. Can you get me one? Me:?? No, sorry, I don’t work in that area. I guess it doesn’t hurt to ask. Later he asked me if Cabrican was far from where we were… while we were on a Cabrican bus. Girl (within a group): Can we interview you for a school project? Me: Um, sure? About what? Girl: The traditions of where you’re from. Me: What kind of traditions? Girl: You know, the traditions of where you’re from. So specific! For lack of a better topic I picked Thanksgiving. They video taped it. Perhaps I should have picked animal care… Might have been more fitting. Man: Is that your cat? Man: Does he always travel with you? Exactly what were you doing posting at 6:55 AM? Are you feeling well? So uncharacteristically early! You make me laugh so hard.